We revisit an old friend, now with a new lick of facepaint, to see if it still satisfies. All the fun of Diablo, and none of the boring bits. 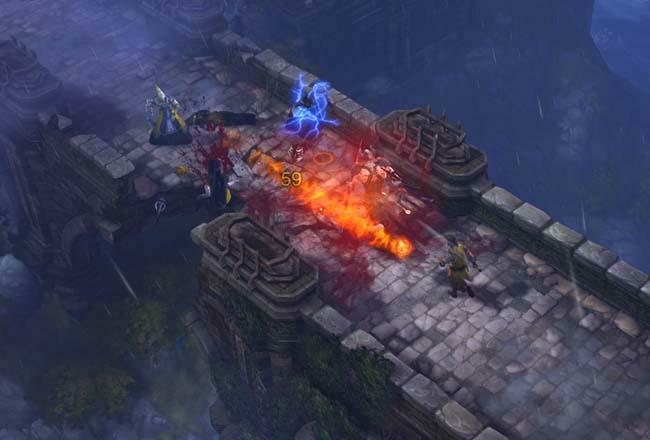 Diablo III is the third in the enormously popular hack-and-slash RPG Diablo series. Developed by Blizzard, the makers of World of Warcraft and Starcraft, it’s set in a quasi-medieval world, with quasi-medieval armour and weaponry, and epitomises an easy-to-play game with simple storytelling and addictive reward systems. Diablo III starts in exactly the same location as Diablo and Diablo II – in a small town named Tristram, which has an inexpicably high frequency of monster invasions. Your quest, as a visitor following a star that has fallen from the heavens, is to wipe out the monsters, solve the mystery of what’s causing them, and eliminate the bad guys at the heart of the problem. Not entirely surprisingly, a major demon named Diablo has several fingers in several monster-producing pies. The quest-solving takes you from Tristram to desert locations and icy mountaintops, before you have to face the final battle. There are numerous boss fights and semi-boss fights along the way to challenge you. You know how with some friends, you can go for years without seeing each other or speaking, but the second you run into each other, it’s as though you never parted? Diablo III is one of those friends. Sure, the outward appearance has changed – a little work done, new hairdo – but inside, it’s still the same, and you’ll still find joy in its company. The most immediate facelift is to the graphics. From the cut scenes to the game itself, everything has been revamped with more detail, a higher resolution, and far more interactivity. I had huge fun just zapping, kicking or firing arrows at parts of the scenery to watch them blow into smithereens. The game even gave me XP for it! It’s also a nice change to be able to zoom in to see your character’s gear close-up. But, unlike many other RPGs recently released, you can’t change camera angle. Diablo III mostly gets around that by allowing scenery to become the fourth wall when needed, but it reduces battle strategy effectiveness. Not that battle strategy is what Diablo III is about. As always, the game uses a simple point-and-click battle mechanic. Sure, it can get slightly more complicated, what with the numbers 1-4 being allocated to skills that you can fire in battle, along with the right mouse button alternate attack, but there are no complex combo moves here. No matter what character type you play, you should find it a doddle to handle your moves. You can choose one of five character types – Wizard, Witch Doctor, Barbarian, Demon Hunter and Monk – and you can play as male or female, for any of them. Each has its own voice actor, and they do a decent job with the distinctly B-grade dialogue. While the character types are designed around a specialisation – Demon Hunters excel at using bows and traps, while Wizards are expert spellcasters – all character types have a selection of four active skill types that support that specialisation. Take the Barbarian, for example, which has a skill subtype called shouts, and a shout called Warcry which increases the armour of you and your companions for a period of time. I've got a preference for Wizards, because I love being able to run into the middle of a swarm of monsters (and nobody does literal 'swarm' like Diablo does swarm), then scream "Aha! Got you my pretties!" and fire off my skills – bang, bang, bang – to toast the lot. 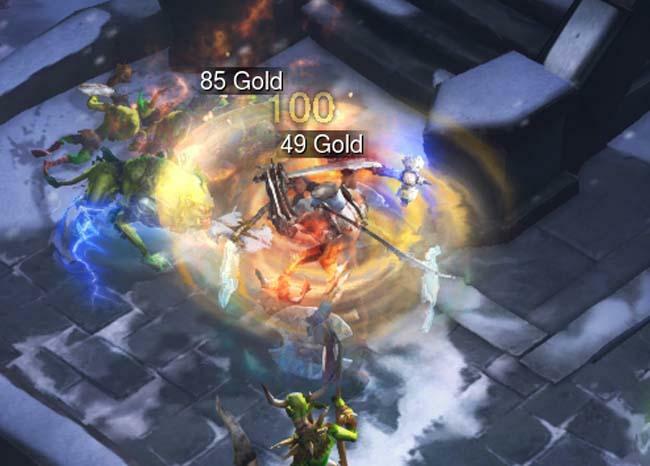 Diablo adds extra pizzazz to this kind of battle by enabling decapitations, dismemberings, flying blood and in one case, a shield dropped by some poor unfortunate that kept spinning like a top for two full minutes after they expired. I couldn't help but watch it until it stopped. In Diablo II, as characters developed, you allocated stat points to each of four key stats. Making a Mage who was incredibly strong and preferred to thwack critters with a staff was perfectly doable. Diablo III does away with customisation of statistics – your points are allocated according to which character type you play. On the other hand, Diablo II gave you a choice of abilities, and once chosen, it wasn’t possible to change your mind. Diablo III, on the other hand, unlocks skills and runes – that add extra benefits to skills – at every level, and you can switch between skills as often you like. You can switch your Demon Hunter from being a stealthy pick-them-off sniper to an all-guns-a-blazing damage machine with just 60 seconds of waiting between. This new style has obvious benefits for killing masses of critters versus a big boss, or even for areas filled with tiny flying creatures versus those filled with lumbering behemoths. On the other hand, it does depersonalise character development. I didn’t get anywhere near as connected to my characters as I did with Diablo II. But character development isn’t the centre of Diablo, much as the storytelling isn’t. You never find out, for example, why you came chasing the falling star, or what you’re going to do about it once the quest is over. The tale, such as it is, is told through shopkeepers, advisors, companions and cutscenes. Suffice it to say that if you’re after a rollicking yarn, you won’t get it. Then again, if you're a Diablo fan from way back, you won't really mind. Each of the companions, has their own tale to tell, but you have to seek it out. If you hire a companion, they’ll rattle off inanities to you constantly, most of which get tiring very quickly, though they have their amusing moments. There's one shown below, where my Barbarian character, low on hitpoints, says that he's hurt. My wisecracking follower says "I find that unlikely". The music is fantastic and atmospheric, adding a fitting background to the action, and the cutscenes are simply gorgeous, but to be blunt, they’re the sort of thing you’ll skip through and it won’t make a jot of difference to the fun. 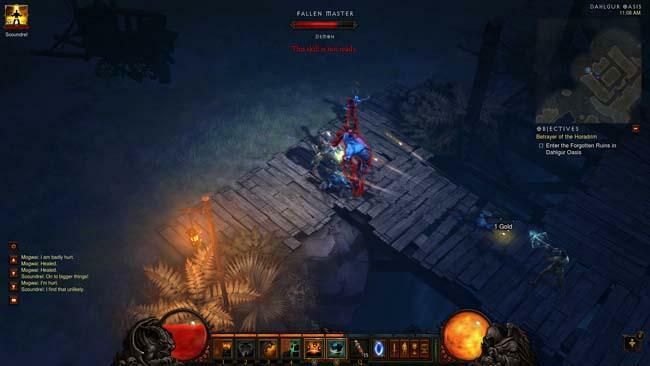 As with previous Diablo games, the main fun is in the constant bombardment of new. Barely five minutes goes past before you’ll face a new type of monster, find (or create) a new type of weapon or armour or learn a new skill or skill rune. You might think that you know how to deal with the humble skeleton, but before long you’ll also have to deal with enhanced skeletons that can strike fear into you, skeletons wielding ranged weapons, and skeletons with skeleton masters capable of rebuilding them mid-battle. Like your shortbow? Have you met the new longbow? Battlebow? Shortbow that boosts your dexterity? Longbow with dexterity and strength? The sheer multitude of combinations of skills and attributes in your gear means making a decision every ten minutes about whether to continue using your old stuff, or switch to the new stuff. Your characters share a single stash, so you can switch gear from person to person as desired. Even when you replay the game on the higher difficulty, there’s no shortage of things to discover – multi-skill enhanced monsters, anyone? I can’t help but feel that in Diablo III, this procession of novelty is as much about keeping you hooked, WoW-style, as it is about anything else. There’s no way, as there was previously, to feel as though you can create the perfect character build. The constant flux of skills puts paid to that, unless you’re committed to only ever playing one set of them, and the game unlocks new and tempting possibilities often enough that you’re unlikely to. For my Barbarian, I hadn't been even slightly tempted to use Cleave until I suddenly revealed a rune that would make enemies explode if I killed them that way. How could I resist? 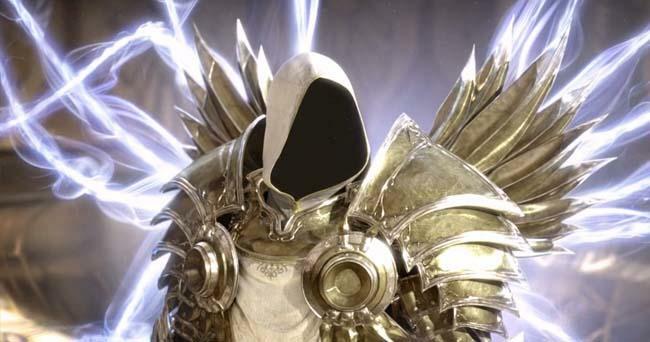 The final important change is that Diablo III is now online-only. That's nowhere more apparent than in 'single-player'. Anyone who knows your battletag can invite you into a game, and friends can just join you – one leapt into my game, abruptly apologised and left again. Apparently he expected someone else? Fortunately, you can adjust this setting to make your game decisively single-player. Still, co-op play is fabulous: entertaining, tougher than single play, and with your own set of loot. This also means that you are now at the whims of Blizzard's servers. They were notoriously unavailable during the first 48 hours, but if you find yourself wanting to play when server maintenance is going on? Tough luck. Online-only means your character is only and always stored on the server, along with all your gear. It was mainly enforced by Blizzard so that the in-game auction house could deal in real money and in-game currency without facing duplicated characters and items. The Auction House itself is a straight forward selling and bid or buy system. You can access your characters and shared stash from the sell screen. The real money portion means that you can spend your cash for great items (or make cash if so inclined). The search system is poor though, so be prepared to wade through a lot of dross to find the item you are looking for. The core of Diablo is the same as it ever was. If you enjoyed the cycle of leveling up, trying on new gear and making new gear, that joy is there there, in spades. Blizzard has cut out much of the distracting cruft to focus on the tasty, tasty, addictive components. And it now has better graphics to view it all with. You'll love it and you'll undoubtedly forgive its foibles. 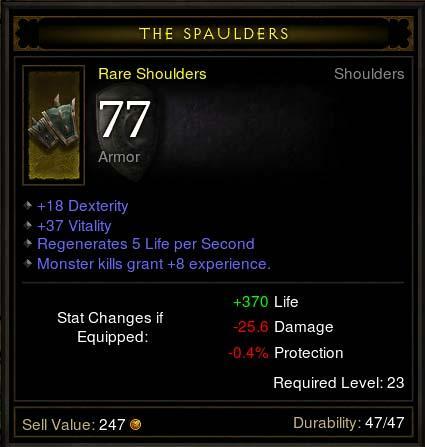 However, if your joy was from customising stats and personalising your character build – that’s less evident in Diablo III. It's still a lot of fun, but at some point you'll get logged out, and forget to log back in.